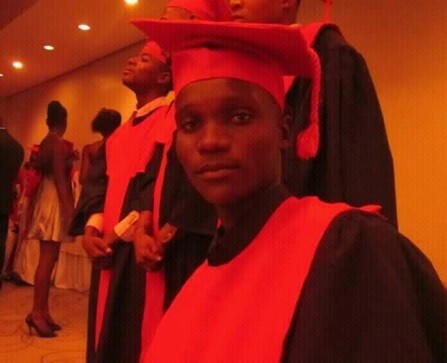 Mathaus is the first Haiti Scholarship Association student to make it to the university level and is also a participant in our Advanced Skype Tutoring program. We are proud of his accomplishments and grateful to our donors who have helped make his educational aspirations a reality. Mathaus' CV can be found at the bottom of this page. Our Havard College 2018 wintern, Janet Chen '19, interviewed Mathaus to learn a bit more about him. Mathaus Geffrard was born in Port-au-Prince, Haiti, and remains deeply involved in his community. 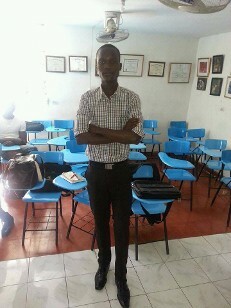 He serves as a youth training manager in Cite Soleil and has also worked as a public relations manager for a development and human rights organization. Mathaus believes that children are Haiti's future, which is why he volunteers to teach English at a secondary school and mentor children. He loves communicating with people to learn about their lives and gain insight from their experiences. After the 2010 earthquake in Haiti, Mathaus put his English skills and passion for communicating to work, serving as a translator for American troops. Mathaus is studying international studies and journalism at Centre de Formation et de Development Economique and wants to continue on to pursue a master's degree in international relations. In his free time, he is a passionate reader and orator. He hopes to use his knowledge to work in international or non-governmental organizations and to someday be an ambassador or secretary general of the UN. Update: Oct., 2018: Mathaus needs the following textbooks for his upcoming winter 2019 studies. If you can help, please get in touch. 1- Phillipe MARCHESIN, Introduction aux relations internationales, ed. Karthala,Paris 2008. 2- Dario BATTISTELLA, théories des relations internationales, 2e édition revue et augmentée, Presses des science Po,Paris 2006. 3-Jean Jacques ROCHE, théories des relations internationales, 8e éd. Paris, 2010. 4- Jean ZIEGLER, la haine de l'occident, éd. Albin Michel, Paris,France 2008. 5- Emmanuel ARNAUD- Arnaud BERGER- Christian de PERTHUIS, le développement durable, éd. Nathan,Paris,France 2009. 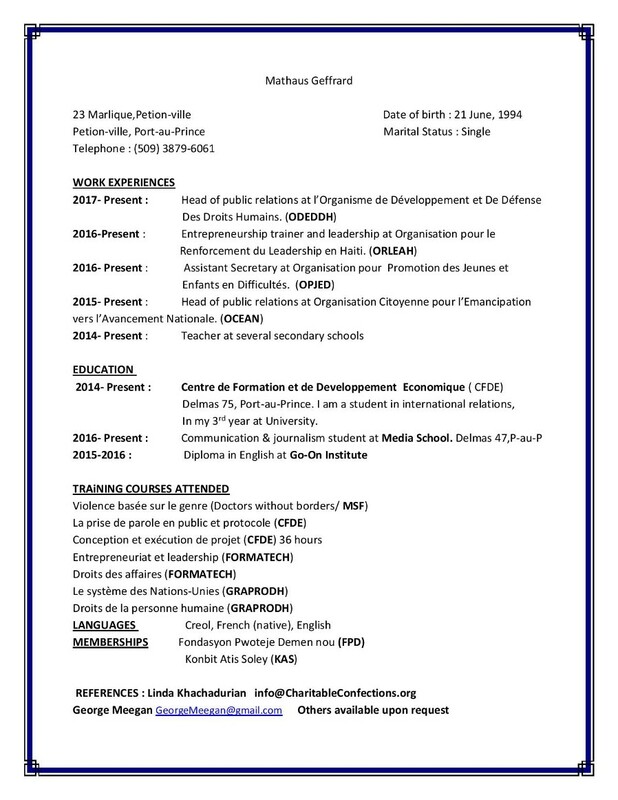 6- Jean-Marie PERETTI, gestion des ressources humaines 19e éd. 7- Gandini JEAN-JACQUES, les Droits de l'homme. éd. Librio,2003. 8- Xavier MAGNON, théories du Droit. **9- Jean Senne,Protocole, the last edition.